We see it more and more with every passing year. Inflammatory diseases that occur on every systemic level are hitting many more people than ever before. Be aware that systemic inflammation is defined as the result of release of pro-inflammatory cytokines from immune-related cells and the chronic activation of the innate immune system1. Pro-inflammatory cytokines, to keep it simple, are proteins that aid the immune system and affect the behavior of other cells that might pose a threat to the body. These cells create an inflammatory response which in the short term isn’t harmful. In fact, they help heal us. However, when the body circulates too many cytokines for too long, the body creates a chronic state of inflammation. Adverse effects of this chronic condition put the body at risk for Alzheimer’s and schizophrenia2, depression3 and cancer4. To avoid chronic systemic inflammation, it is imperative that one adopts an anti-inflammatory diet so that the risk of such adverse events is significantly reduced. “Foods that spike the blood sugars quickly, along with trans fatty foods can instigate inflammation. These pro-inflammatory food include grain fed, non organic meat, excess sugar, wheat, corn, soy, dairy, trans fats labeled as hydrogenated or partially hydrogenated oils, found in many processed foods, omega 6 vegetable oils, such as corn oil, safflower and sunflower oils used in most restaurants for frying. They cause over-production of inflammatory markers in the blood which can lead to joint disease, chronic fatigue, neurological diseases, cancer and atherosclerosis, to name a few. Your goal is to adopt an anti-inflammatory diet,” says Dr Yvonne Maywether , an age management and functional medicine doctor in Southern California. So what does an anti-inflammatory diet consist of? Fish that is high in Omega 3’s: Salmon and sardines are excellent sources of omega 3’s, all of which can lower inflammation caused by arthritis5, and decrease the risk of cardiovascular disease6. Maywether suggests that everyone supplements with a minimum of 3 grams of fish oil that is well balanced in DHA and EPA. Dark leafy vegetables: Spinach, kale and broccoli are vegetables that are rich in disease fighting phytochemicals, and also containing higher concentrations of vitamins and minerals. Beets: these brightly colored plants are loaded with anti-oxidants which fights off oxidative stress to the cells, thereby reducing inflammation. Simply couple your beets with a protein (animal source) or healthy fat (nuts, avocado, some oils) to void any high sugar spikes. Ginger: laboratory studies have shown anti-inflammatory properties in ginger and has proven to lower inflammation in rheumatoid arthritis patients7. It has also shown to lower gut inflammation when taken in a pill form. Turmeric: has shown an anti-inflammatory response to the joints.8 Maywether stated cur cumin, the phytonutrient found in turmeric decreases inflammation by decreasing the pro-inflammatory cytokine NF-kB, which is a known driver of chronic disease. You can find turmeric in the spice curry, which is used in Indian and Asian cuisines. Nuts: almonds in particular, contain high ALA levels which is a form of Omega 3’s, along with fiber, calcium and anti-oxidants, all which aid in fighting off inflammation and any damage from it in the body. Water: drink half your weight in ounces of water daily to keep your cells active in transport of harmful toxins out of them regularly. Water also keeps your organs in check, thereby creating a homeostatic state which will keep inflammation in check. Fiber: One should consume between 30 and 40 grams of fiber every day. Most people get in less than 20 grams a day, through refined carbohydrates, all pro-inflammatory foods. Instead, consume foods such as berries, dark leafy vegetables, ½ cup of beans, avocado, artichokes, pears, and apples. These foods will lower blood sugars while improving gut health, while lowering serum cholesterol. 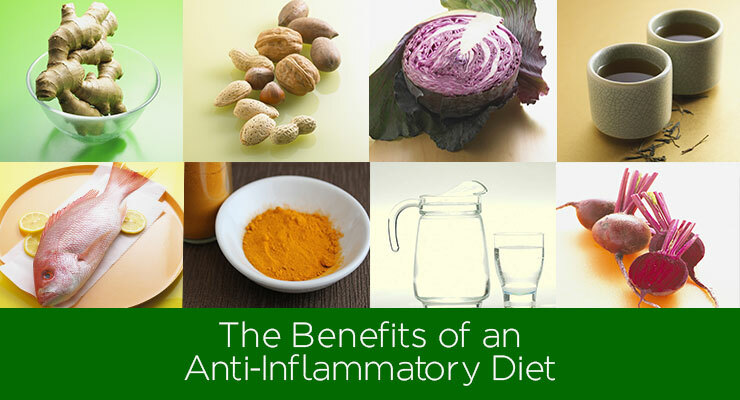 Lower your incidences of systemic inflammation through consuming these anti-inflammatory foods on a daily basis, and you will decrease your risk of developing the diseases mentioned above. Make sure you eat an anti-inflammatory diet on a consistent basis and be mindful of not veering away from these new habits. As much as you might miss certain foods that cause inflammation, over time your body will adapt to eating optimally. You will see that you eventually lose your desire to eat the pro-inflammatory foods. Give it time and you will see your body evolve. You will even feel the difference of lowering inflammation in your body, perhaps not even realizing your body was inflamed to begin with. Dowlati Y, Herrmann N, Swardfager W et al. (2010). “A meta-analysis of cytokines in major depression”. Psychiatry 67(5): 446–57. Swardfager W, Lanctôt K, Rothenburg L, Wong A, Cappell J, Herrmann N; Lanctôt; Rothenburg; Wong; Cappell; Herrmann (2010). “A meta-analysis of cytokines in Alzheimer’s disease”. Psychiatry 68 (10): 930–41. Locksley RM, Killeen N, Lenardo MJ; Killeen; Lenardo (February 2001). “The TNF and TNF receptor superfamilies: integrating mammalian biology”.Cell 104 (4): 487–501. Cleland LG, James MJ, Proudman SM.(2003). The role of fish oils in the treatment of rheumatoid arthritis.Drugs. 63(9):845–853. DeFilippis AP, Blaha MJ, Jacobson TA.(2010). Omega-3 fatty acids for cardiovascular disease prevention.Current Treatment Options in Cardiovascular Medicine. 12(4):365–380. Cameron M, Gagnier JJ, Chrubasik S. (2011). Herbal therapy for treating rheumatoid arthritis. Cochrane Database of Systematic Reviews. (2). Ahmed S.(2010) Green tea polyphenol epigallocatechin 3-gallate in arthritis: progress and promise. Arthritis Research and Therapy, 12(2):208. Intahphuak, P. Khonsung, and A. Panthong(2010). Anti-inflammatory, analgesic, and antipyretic activities of virgin coconut oil.Pharmaceutical Biology, 48(2), 151–157.